I last updated this page two years ago and this was my first sentence: I’m a wife, mother, friend, and more. If you follow my blog you know much has changed. If you are visiting for the first time, I encourage you to read some of my older blogs. The Lord has weaved some things both in and out of my life, yet He has remained constant. At this writing, with a view towards authenticity, I am not a wife, I question my role as mother yet this cannot be taken from me, I am blessed with some exceptional friends who I love to the moon and back, and the world has yet to come up with a name for people when their sibling(s) die. I also have the world’s most amazing sister, and a twin at that. With that, please allow me to continue with my initial introduction. I am also a patient in the medical community. I make a conscious decision to choose joy.. I choose joy because this is the best option. Because the other option. . . is not an option. What I believe: I have decided to include a brief summary of my most core beliefs here. This is a synopsis, not fully encapsulating by any means, but I am nothing if I do not leave you with my most important treasure. It can be summed up well in the Apostles’ Creed, with all credit to Billy Graham. The Word of God – It reveals the principles by which God judges us and will remain to the end of the world, the true center of Christian union, and the supreme standard by which all my conduct and opinions should be tried. God – God is all powerful and all knowing. His perfect knowledge extends to all things, past, present, and future. We owe Him our greatest love, obedience and reverence. The trinity reveals Himself to us as Father, Son, and Holy Spirit, with distinct personal attributes, but without division of nature, essence, or being. God the Son – Why believe in Jesus? See Do you Really believe in Jesus? God the Holy Spirit – Convicts me of my sin, righteousness and judgment. He enables me to understand Truth. He is my Comforter. He seals me until the day of redemption. There is so much more I could say, and I could include so many Bible verses here. Instead I decided to post it this way, with hyperlinks included to a few articles. I would love to talk to you if you have questions or would like to discuss further. Most of all know that I love talking and engaging. I am not a product of any hate or finger-pointing. This is a welcoming place for all! If you haven’t done so, you may be interested in visiting my The Joy Project. The link is listed on the home page of my blog if this is where you started. I post a lot of encouraging things throughout the week that are not in the blog. Thank you for stopping by to visit my blog. I pray these words give you encouragement and hope in whatever circumstances you face today. I love your attitude. I enjoyed reading your blog, well done! Thank you very much! My desire is to be authentic with some of the challenges that I have encountered while showing how I reached an attitude of joy. I am a perpetual work in progress, for sure. I love your attitude, too. Thank you very much for liking my post about my personal psychosis (http://gammagamification.wordpress.com/2013/08/06/circles-of-fear-a-very-personal-story-episode-1-spring-2006/). Maybe you might also light my posts about ten thoughts that changed my life (http://gammagamification.wordpress.com/2013/08/02/ten-thoughts-that-changed-my-life/) and about meaningful activities that make you happy while doing them (http://gammagamification.wordpress.com/2013/07/20/how-to-transform-work-into-a-meaningful-activity-that-makes-you-happy/). Started to follow your blog & will definitely check out your blog this weekend. P.S. : Would you like me to read one particular post? I would love to someday reach this attitude of joy that you have! Sounds like you have so much to deal with and you seem such a strong, wonderful person. I will definitely be looking more at your blog, I need THIS kind of attitude! Thank you so much! I have enjoyed reading yours as well, and also subscribed to your blog. I appreciate it! I appreciate the reply you made to the comment I left on “World MS Day”. I showed your blog to my mom and she liked it as well. We wanted you to know that we’re placing you on our blogroll, though we don’t have many readers yet; when we get them, we hope they’ll take a look at the inspirations you have to give. I am so thankful it encouraged both of you! I hope you have a huge success with the MS Walk this year. I am so happy you enjoyed my post, and you know what – you are RIGHT for choosing joy in your life because you know what sweety – this life is what you make it, every living day we are in danger of all the harm the world throws at us, but thanks to God and His GREAT Graces, we have hope and honour to still live and accomplish anything we set our minds to and to still live in His abundance. So, I know medically you may have been told that you are limited to a lot of things, but my dear, because of the positive spirit you have, dear-heart, you will kick MS a** so hard it won’t even want to mess with you or anyone else ever again. You are SUPER awesome and ALL the Greatness God brings your way, sweety you deserve it. Keep fighting the great fight doll, it is not in vain and God will bless you beyond your wildest expectations. I too, recently was diagnosed with Asthma (at 40yrs old) and was told I had it my entire life. WHAT? I had a heck of a summer with having a FLARE UP and am now seeing a specialist trying to get it under control. It’s been 2 months of focusing on breathing, but I know we’ll get this thing controlled. Negative attitudes do not help situations- it just makes you feel worse…being positive is the only way. I just think of poor Job. Although these are your burdens to bare, GOD has also blessed you with gifts. You are touching many people with your JOY and I am thankful to have found your site. I can relate to your shock of the diagnosis of asthma. I, like most people I know, thought it was always diagnosed during childhood. I have been told that this has been a particularly bad summer for asthmatics. My pulmologist informed me at a visit last week that he is seeking insurance approval for monthly injections that have to be done at his office. I was VERY frustrated to hear that – until common sense kicked in & I realized it is for my benefit.I am also so thankful for Job’s story, like you. It brings any pity party to an abrupt halt! I read a comment by Oswald Chambers that has stayed with me for years – ‘Pity is of the devil’. I can’t think of a time that it has been beneficial to me, that is for sure!I hope your asthma is soon brought under control. Thank you for the encouraging words! Having support is key for sure. I’m glad to hear you have a loving family to help you. I love your emphasis on CHOICE. We can’t choose what we have to go through at times, but we can choose HOW we will go through it. We have Fragile X Syndrome in our family: my daughter has it with Autism and some other disorders. Thanks for the reminder to CHOOSE joy because there really is no other option 🙂 I’m going to follow you…to joy! I’m glad it was encouraging to you! I look forward to reading more of your blog as well. Very positive blog. Love it! Great attitude! I find when we (I) keep a grateful spirit, everything else in life pales and falls into place. There are so many who have worse problems than any of us. My mom passed away with pancreatic cancer in December last year. She didn’t do chemo and her life was much richer for it. She had good days and bad days, but what I saw in her was an encouragement to me and my brothers and family. She was a great example for her family. Her faith carried her through many rough days in the six months or so she lived after diagnosis. While it didn’t lessen the pain of loss, necessarily, seeing her faith tested and put into action was a great example for us. I am so sorry for the loss of your mother. It sounds like she was a very notable example of great character in the midst of many challenges. I firmly believe you can always find someone whose situation is far worse. . . and many examples of people like your mother whose attitude is worthy of modeling. Thank you for sharing your story. Thank you, I appreciate that greatly! I am typically to blogging and i actually admire your content. The article has really peaks my interest. I’m going to bookmark your site and hold checking for brand new information. I would love to see where your journey takes you, and you definitely fit the type of person I want to follow, so here goes…. Thanks for visiting my site and encouraging me. What a gift you are!!! Thank you! Love your site as well! You are most welcome! Great blog! Wow, you have a beautiful outlook ! I look forwarld to reading your blog. Sending many blessings your way! Thank you so much! I look forward to reading more from your blog as well. Thanks for liking my “joy” post on 2×2. We have some similar challenges in life. Joy is a good choice. How beautiful that you chose joy in your difficulties instead of bitterness. Blessings to you and thank you for stopping by my blog. Thank you. Some days it is a natural occurrence; other days it is an act of faith to put it into practice. I enjoyed your blog very much! Yes, yes, yes! It’s all about the attitude. And I love yours. I/m glad I found you. Be blessed! I hereby humbly announce that you have been awarded the “Courageous Blogger Award”. There are no set rules, but please come by http://kipsthoughts.wordpress.com/2012/08/22/the-courageous-blogger-award/ and grab your award and possibly pass the love forward to bloggers you find courageous. Congratulations! Wow, thank you! That is very kind and encouraging. I am so touched!! I cannot tell you how much I love this attitude (especially coming from someone with health challenges). If you can find joy, then those of us who are blessed with good health have no excuse for not looking on the bright side of life. That is very kind of you. Encouragement from people like you makes such a difference. Imagine how Joseph felt, thrown into a pit without water by his very own brothers. Nothing but a dark outlook ahead as he was cast into slavery, forgotten and disowned. And then it got worse. But he never lost his victory and he finally came forth like a butterfly out of a cocoon. I hear that same victory in your voice. How easy it is to hold a positive attitude when its not you that is in the pit, but it takes real depth, substance, and courage to declare your joy and victory when you are in your place. Thanks for you bright light. What a great testimony we have in Joseph. Thank you so much for your kind and encouraging words. Thanks for liking my post! I love your attitude. Good luck with everything. Thanks for stopping by my blog and liking the toffee almond sandies. I hope you try them sometime and let me know how they turn out! Thank you for liking my post because I was able to find yours blog! Your life story really spoke to me. I have been taught that the kingdom of God is righteousness, peace, and joy in the Holy Spirit. One of the root meanings for righteousness is “right thinking”! You are truly living in the kingdom. God bless you. The trademark for a Christian should be joy (Gal 5:22) and you are living that. I pray healing for you as well. Exactly! That is my life verse, and my goal in this blog is to show how I try to live it out. I’m thankful we found each other’s blogs as well. This is so inspiring! The joy of the Lord is my strength. What other way to stay positive than be Joyful! You’r right when you say its the only option. I’ll encourage you to stay true to your resolve to be “overwhelmed by Joy” and keep the word of the Lord always before you……there will b glory after this! *smile! Gives me courage to fight with my difficulties. You have discovered the secret to all happiness…CHOOSE it. Good for you! Thank you for stopping by my blog today, and hope you’ll visit there again. I’m certainly going to take a long look around yours. Have a great day! It is not easy being a caretaker for an aged parent, and it certainly isn’t easier when you have your own physical problems to deal with while doing so. Your strength of character is amazing. I wish you the best in the difficult road you must travel. That is so very kind of you! I will be sure to reply tomorrow. Thank you again. Wow, what a wonderful way to look at life. You are an inspiration. I appreciate your kind words. It is a choice every day, and some days are easier than others. You chose a great name for your blog! What a wonderful attitude! God bless you. What a great way to view life. Choose joy. That’s a bumper sticker we can all like! That would make a great bumper sticker! hello and thanks for stopping by my blog – treasureofeden – I’m glad you like it, do stay tuned and remember the Lord loves you. I greatly enjoyed your blog. Yes, very thankful for His love. I will pray for you. Stay strong. Im currenty applying for diabilty right now. I diagnosed with schitzoeffective disorder and ive been diebetic since i was sixteen. Its been ten years. So stay strong and thanks for checking out my blog. Hope you come back and God bless. You are brave! Your words are encouraging. May God bless you and your family abundantly and give you strength in your battles. Thank you ~ He definitely does! Thank you for following my blog! My thoughts are with you on your journey and I look forward to reading your blog! I enjoyed it! Keep writing. I definitely will! 🙂 Hope you’ll do the same…. I have a friend whose mother has just been diagnosed with MS. We stand with you and her for a complete healing in Jesus’ Name … as He did for Heidi Baker so I pray he will do for you too! She was healed if MS. Blessings. God is Good! Thank you so much! Let me know how she is doing. Thank you for reading my blog on dementia. When I read your bio, it made my moans & groans seem quite insignificant. Thank goodness for the good, kind & caring people in the world like you. There aren’t enough of them. Thanks for visiting my blog recently. Choosing joy when faced with so much adversity is inspirational and I have enjoyed browsing your blog very much. Looking forward to following. You are welcome. I’m looking forward to following yours as well. I have found your blog to be quite “lovely” and nominated you for the “One Lovely Blog” award. Go to yomicfit.wordpress.com to check out the rules. Thank you!That is so kind of you. I will be sure to respond tomorrow. Thank you for checking out my blog, Dear Ms. Migraine. Joy is an amazing option! I like your blog. As the carer of my partner who has had MS for twenty years, and now needs more care than ever, I find it difficult to read some of your very valid contributions simply because they are too close to the bone! There is a Portuguese saying which translates loosely as “There is no life without faith”, something which I heartily endorse. During today’s ablutions and dressing routine, my partner said “Don’t worry. I’ll get there. It is a difficult mountain, but I’ll get there in the end.” While I take such statements with a pinch of salt, I cannot negate her faith. Besides, how we get to that destination, I suspect, is never quite how we imagine it will be. Allison, I am so moved by your story as a caretaker and how both of you strive to live with the challenges of MS every day. It is so very true that the journey to our destination is far different from what we imagined at the beginning. That is perhaps the greatest challenge with MS ~ not seeing what lies ahead and how to deal with both the known and unknown variables. I definitely hope to try it soon! It looks wonderful! Great. I’m notoriously lame at crust, so I opted for store bought. I used Marie Calendar… I pre cooked my shells for 10 mins and they were fab. Mike used the roll out kind, store brand. And those were also very good. But I think the Marie Calendar were a bit flakier. thank you for the *like* and leading me here. I look forward to more from you as well! You’re have an amazing journey..continued blessings! Thank you! And thank you as well for stopping by! Thank you for visiting and the ‘like’ on my blog. I am inspired by your blog and attitude of ‘Joy’. Joy is the first three letters of my name (Joyce) and I hope I can radiate the same kind of Joy to others as you do. It is wonderful to have that with all that you are faced with. A bit about me that we have in common: My brother who is in his fifties (almost 9 yrs. younger than me) also has MS and struggles with it daily, and often gets discouraged at his disabilities. He gets ‘infusions’ for it every two months. He works with NASA and is one of the last employees there to still have a job (Praise the LORD)! Oh, and as you might have been able to tell. I am also a Christian, a mother, grandmother and been married 46 years to my one and only husband. God bless you. We do have a great deal in common! I have been married just under 27 years, but we share all the other things in common. How is your brother doing with his infusions? Is he receiving Tysabri? I am glad to hear he is still employed. I am not sure of the kind or medication name as to whether it is Tysabri, but will ask him. He does ok as long as he has the infusions but he gets weak on the right side and it affects his balance, nerves, etc. Yes, I am thankful he can still work for now. Thanks for the reply and interest. The best to you and your health, also. Thank you for your courage and compassion!! Thanks for the blog like. I look forward to hearing more from you! Thanks for stopping by! Terrific attitude! It’s a pleasure to know you. Thank you for introducing your blog to me. I enjoyed reading. Big hug to you and your Mother. Thank you ~ I will! What you look for in life you will find- whether it is cynicism, pessimism, beauty, or joy- And I am glad that God has opened your eyes to see joy even in your suffering and hardships. Thank you for the encouragement and another reminder to be thankful. That is so true. Thank you as well for your encouraging words. Thanks for reading my post today. I enjoy your blog, as well. Thank you, that is so kind! You are a person of integrity and determination! What a great combination! I have enjoyed browsing your blog! Thank you! I am enjoying yours as well. I will send you a note shortly. I appreciate your reading my blog. Your blog is so inspiring. Keep up the good work! I appreciate that ~ and thank you for stopping by! Thank you for visiting my blog. I certainly admire your attitude. I have numerous health problems and have not yet succeeded in creating ongoing joy, though I am getting better at it. You are an inspiration. It is a lifetime process, no doubt about it. Keep me posted on how you are doing. Thank you as well for stopping by. So grateful to have found your blog…I need to be reminded that a life of chronic pain doesn’t have to be all misery. Thanks. I agree – anyone who lives with chronic pain needs that reminder, including myself. Thank you for stopping by. Thanks sweetie for liking my show…! Thanks for stopping by my blog and keep being joyful! Thank you so much! Thank you also for stopping by. Dear Joy, Thanks for your quick comment on my WordPress blog. Satan keeps trying to discourage me, but how can I stay depressed when God is on my side! That is true! It can be a daily battle, but keep fighting. It is worth it. This is an inspiration to me. I am so glad to hear it encourages you. Thank you for stopping by. Thanks for “like”ing my posts. I, like you, try to stay positive through whatever comes along. I’m not always successful but the optimism is worth the effort. So keep it up, I’ll certainly look around your blog more. I agree, it is always worth the effort. No one does it perfectly, but there is so much benefit to striving for the goal. Thank you also for stopping by! I love your Blog and your spirit. Life is a fantastic journey, the good and the bad. I am honored to share this life space with a women who faces adversity and comes out better and stronger in spite of it. Thank you for sharing you gift with me. I agree ~ life is a fantastic journey! We wouldn’t know how good things are if we never had the bad days. I greatly appreciate your encouraging words! Exactly. No one is unique to having challenges in their life, but we do have a choice in how we respond. Thank you for liking my Birthday Blessings post. The joy of the Lord is my strength. Choosing joy is the only option. May God continue to bless you in all that you do and all that you are. I too choose joy. Love, joy, peace and blessings to you! Happy birthday, by the way! I failed to say that under your comments. Thank you for stopping by my blog as well. Thanks for visiting and for the like :-). Wish you and your mother well. Take care. Thank you for visiting my blog….and introducing me to your lovely blog! I look forward to reading more! I am looking forward to hearing more from you as well! I appreciate that very much. I hope the blog encourages others to try. The difficult times will come, no question. Thank you for visiting my blog and liking my post on Alzheimer’s awareness. I wish you well in your journey as caretaker for your mother. How lovely to have discovered your inspirational blog! I will most certainly check back again! Thank you so much for stopping by a liking a recent post. Thank you ~ very kind! Thanks so much for liking the last post on my blog. Your blog is amazingly beautiful. I just started following you. Health, joy and best regards. Thank you so much. I look forward to reading more from you as well. That is an inspiring quote that speaks well of what my true goal should be. Thank you so much for sharing that and for your kind words. Try to laugh as much as you cry. It’s what will keep you alive. Believe me I know. Hang in there friend. Thank you. Laughter really is the best medicine. I appreciate that you stopped by my blog. 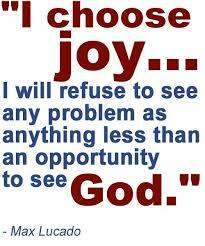 “I chose joy…” What an encouragement! What a testimony! When I saw your username I smiled (a name like that will make you smile 🙂 ) and I just had to follow the link. Once I read your testimony, for that’s what choosing joy means, I *had* to say more than the customary “thank you for liking”. You have what I term an “in spite of” praise. You choose to have joy despite the circumstances you face when many would give up, curse God and die. Bless you dear heart and may Heaven continue to shine upon you. You are in my prayers and in my heart but most of all you’re in the heart of God. Thank you for such kind words! You have captured exactly the message that I always hope my blog conveys. Joy, for me, isn’t ‘because of’, it is in spite of, in the midst of circumstances. Thank you for your prayers. The week has held some challenges, but God is always greater! God is always greater! After two battles with cancer I too had to develop that ‘in spite of praise’. The joy of the Lord is our strength in all situations. I’ll continue to send up prayers for you and your mother. No weapon formed against us will prosper! What an inspiration you are! Thank you so much for your prayers. Are you doing well now? Bless you precious heart, yes I’m doing very well. I just went to the doctor yesterday for my three month check up (which is customary for those who’ve survived cancer) and I had a good report. Praise God! That is fantastic! Glad to hear it! Thanks for liking my images….your blog is truly inspirational…keep up the great work! Thank you! I enjoy your work immensely! I enjoy your work immensely! Thank you as well for your kind words! Thank you for following Ivory Mocha Lime and for liking the posts. I admire your attitude and you have a very inspiring blog! Thanks so much for visiting my blog and liking “The Quiet”. I love your outlook – the choice of Joy! Very inspiring. Please stop by my blog again soon! I definitely will! I love your work. Thank you! Thanks for visiting again today! Your Joy radiates from your blog…you make me smile! Wow. What an inspiration you are. Praying you can stay true to your choices, here! I appreciate that. Every day is a choice. Thanks for visiting the blog and glad you enjoyed the photos of the early fall color. I need to get out and take more of my pictures, to much of my time this summer was consumed by the negative energy my mother has brought to the house since I had to move her in. She is such a complete contrast to my dear late wife, Donie. Donie was always positive and decided she preferred being happy, despite physical limitations of her stroke and COPD. My mother, at 84, prefers to sit and brood over every ache and pain. I wish she could be more like you and my late wife. First, I absolutely love pictures of fall. It is such a beautiful season. Also, I am so sorry to hear of your loss of such a wonderful wife. Being frank, I get frustrated with a few people who seem to miss every blessing in their life. I can’t imagine the challenges you face in caring for her. Everyone handles stress differently, but photography is a great outlet. I hope you take time for yourself. You deserve. . . and you need it. Joy is a beautiful choice! Thanks for stopping by The Brass Rag. Come back and see us again soon. Meanwhile, happy writing. Thank you! I enjoyed your blog! Thank you for visiting featherglass: the Magazine and the Like. Visiting Overwhelmed by Joy reminds me that it’s all too easy to take things for granted, especially the “little” things, which, if taken away, won’t seem so little afterall. I like that your space reminds us to keep reaching for that joy that rests inside and to always count our blessings. wow…thanks for visiting my website. my grandmother died of MS and i never knew her. i just started following your blog and look forward to hearing more of your story. I’m so sorry to hear that. Thank you for stopping by. JOY will always be in our hearts! 🙂 Glad to be here! I love what you say about choosing joy…fantastic!!! Thank you, and welcome to blogging on WordPress! I have way too many nicknames, but you are welcome to call me Patricia. Thank you for stopping by! Great blog, I am sure you get a lot of strength out of what you are doing here. Keep on enjoying life, because as hard as it may be its always beautiful to be able to breath. Keep up the positive energy. Thank you, I appreciate the encouragement. Thank you for stopping by! You sound like a really good person, I wish you all the best. Thank you. If nothing else, I show the real me. Thank you for stopping by. Yes, that completely right. Much easier to be yourself. Thank you for your positivity and thank you for checking out my blog! I am an overcomer of breast cancer, and that was enought! I’m so glad to hear you no longer have it. That is fantastic to hear! I am sure you have a great deal of wisdom to share. Dear Overwhelmed by Joy. I am so glad you found my blog. I can relate to your medical pain but I know you have a different story. My mom also has Alzheimer’s …… as did my great-grandma, and grandma. I don’t want to think I might have that gene. Oh well, if I do I know God will provide. I hope to hear from you in a comment or two. Please share my site with others you think might find it encouraging. Thanks! We certainly have a lot in common. I am supposed to have an MRI to check for any hints of it , and I just can’t bring myself to do it. I need to update several things on my site, including that page. I will add your blog as a link. Thanks! Listen, I had my one year follow up MRI a few weeks ago and I was terrified. It was like having my first MRI because I don’t remember my previous 3, except to vaguely feel like I was a gerbil in one of those balls you let them run in. My son came with me and I was very teary but… It was a relief to find out that the tumor had not grown back. I will pray for you…Courage, Wisdom, Health! I simply had to tweet this after reading it again – Absolutely Amazing. God BLESS you ~ ALWAYS! Thank you ~ praying for God’s blessings on you today! Thank you ~ you are so kind! I agree, the work of the Holy Spirit it is what makes it possible. On my own strength, I do not have the strength to have the right attitude. How deep are the resources and strength when it is generated from Him, who has an endless supply to give and to supply me with just when I need it. Thank you for your comments and encouraging words. I have been following your blog for a while, and I am constantly reminded of God’s unending mercy and grace when I read what you are going through. You are very inspiring, and very honest about your struggles. And, that is very refreshing. Many of us want to say that God’s grace is enough and He can bring us through anything, but that is difficult to “walk out” sometimes. . To know that we may struggle, but the Lord is with us gives us hope. And, sometimes hope is very powerful. You provide hope to many who may be hopeless, feel helpless, and be alone. Thanks for sharing your life with us. I am very humbled by your words. I appreciate it very much. Yes, hope is perhaps the most powerful thing. I am reminded immediately by your words of Heb. 11:1 ~ Now faith is the assurance of things hoped for, the conviction of things not seen. I would be nothing without hope, grace, and mercy. Thank you so much! That is very kind of you!! Thank you, I appreciate that very much! Thank you! I look forward to more from your blog as well. Christmas is such an opportunity to give others the reason for our hope and faith. Merry Christmas! You’re welcome and Merry Christmas to you as well! Thanks for your like! Thanks for your posts. They are very inspirational and enlightening. Geat to meet you, thanks for checking out my site! I look forward to reading your blogs! Can’t wait to get your posts in the future and keep in touch! I have nominated The Very Inspiring Blogger Award. Go to http://kingspeech.wordpress.com/ to check it out. I have also nominated you “The Blog of the Year 2012” award. Please go to http://kingspeech.wordpress.com/2013/01/09/blog-of-the-year-award-2012/ to take a look at it. Hi! I just want to let you know I’ve nominated you for the Very Inspiring Blogger Award. Your courage and attitude is a testament to God’s faithfullness and mercy. Your site is an encouragement to all of us. I nominated you for the Illuminating Blogger’s Award…here’s the link! What can I say other than best wishes? Thanks so much for the follow! Your blog is great, and I’m happy to be a new follower! Enjoyed your blog posts particularly the one about Alzheimer’s. My mother in law is in the moderate phase. Though it is a dreadful disease we choose to find humor in the funny things she does and says. Thank you for the comments. I try to find a balance in my blog posts on Alzheimer’s to show the very stark reality of Alzheimer’s effects while also bringing out some of our lighter moments. It has certainly taught me a great deal. I am glad to hear you are finding some of the lighter moments while they come about. Blessings. Healthline provides a very comprehensive overview of Multiple Sclerosis as a critical starting point for individuals and/or their loved ones. For more information about our rigorous editorial process, to view our board of directors and more visit the Healthline about page: http://www.healthline.com/health/about-healthline. Please let me know if you are open to adding Healthline’s MS center as a resource. Thank you in advance for your consideration, and I look forward to hearing back from you. Absolutely! I will be sure to do so the next time I am on my laptop. Thank you for visiting my blog. You’re positive attitude truly is infectious! Thank you for sharing! Thank you! I am glad to hear I am an encouragement to you! I love your blog and attitude! I’ve been dealing with my FIL who has Alzheimer’s and my Mother who has lung cancer. I maintain a positive attitude with them both and its been so rewarding as that’s what they truly need and love. That is so true! I’m glad they have you there to be an encouragement. A positive attitude can be a challenge to offer at some stages but that is perhaps the best gift of all. I’m happy they have me too! I love spending time with them both, in fact, I’m leaving for Montana this coming week to spend a fabulous month with my Mother. Then I’ll return again last week of June then off in Sept to see my FIL. Your blog is so inspiring! That is great! I look forward to hearing about some of your special memories from both trips! Thanks for visiting.our blog, what a blessing to see what a positive attitude you have through the Lord in what you are going through. I have been battling cancer for 10 years and taking care of my mom as well. With His strength it keeps me going. He said He would not give us more than we could stand and that He will walk with us through these trials. May His hand continue to be upon your life and May He continue to use you to touch others and give you wisdom, strength and peace. That is truly the only way I know how to have the strength to keep going through my trials, and it seems so with you as well. I pray many are encouraged by your faith as you go through this, and see that Christ is the hope in all our trials. Thank you for sharing. Thank you for visiting my site! I’m glad that it led me to yours, and I look forward to reading some of your posts. What a blessing your decision to choose joy is! Thank you for being an inspiration! Thank you for liking my post! Your outlook is exactly where I find myself. Some of my current circumstances are rather discouraging and challenging, but I choose to praise Jesus and focus on the joy I have in Him, my Hope! Thank you & thank you for stopping by my site as well! I nominate you for the One Lovely Blog Award! I am having a very difficult year and struggling with how to write about what is going on while not violating other’s privacy. I would really appreciate your prayers. Thanks for checking on me. Praise the Lord you are able to find… and CHOOSE joy! 🙂 Keeping you in thoughts and prayer! God loves you! Thanks for stopping by my blog and liking the post. I am glad to find your blog. I enjoyed yours very much! I definitely need to update the section ‘About Me’. You´re a strong woman, God bless you, I like your atttitude Joy. Thank you, my strength is truly from the Lord.